The Oberbaum Bridge is a double-deck bridge crossing Berlin’s River Spree, considered one of the city’s landmarks which links Friedrichshain and Kreuzberg, former boroughs that were divided by the Berlin Wall, and has become an important symbol of Berlin’s unity. The lower deck of the bridge carries a roadway, which connects Oberbaum Straße to the south of the river with Warschauer Straße to the north. The upper deck of the bridge carries Berlin U-Bahn line U1, between Schlesisches Tor and Warschauer Straße stations. 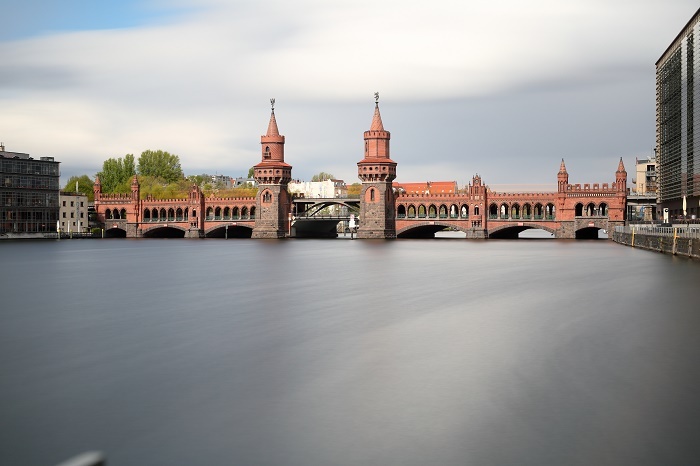 It was built on the site of a previous timber bridge built in 1724 when the construction of an elevated railway required a reinforced structure. 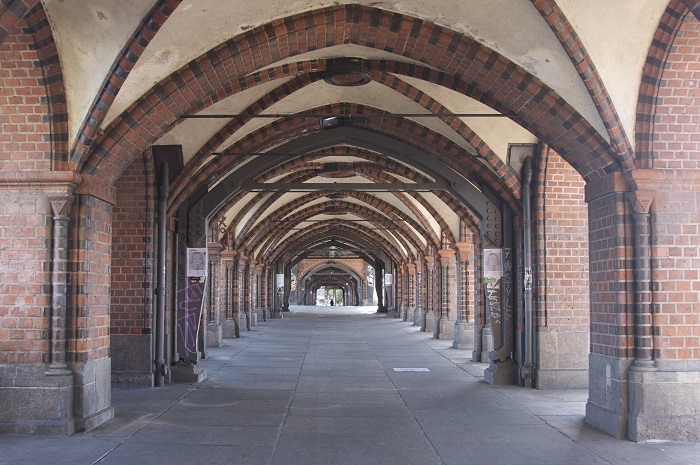 The result was a seven-arched concrete bridge with a granite and brickwork façade. 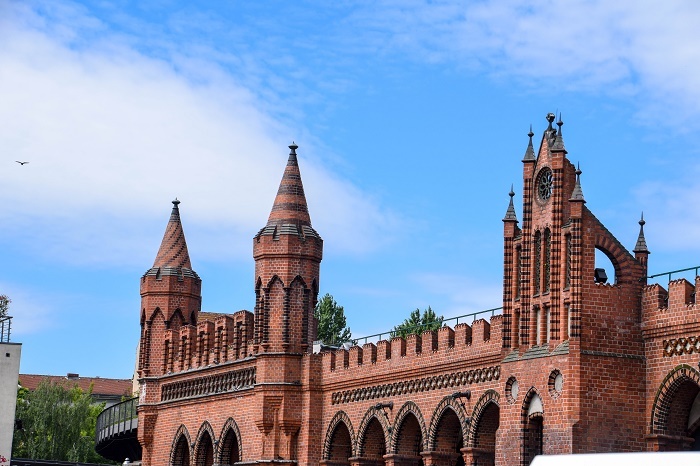 It is distinctive architecturally because of its mock medieval turrets which recall the function of toll bridges and arches. 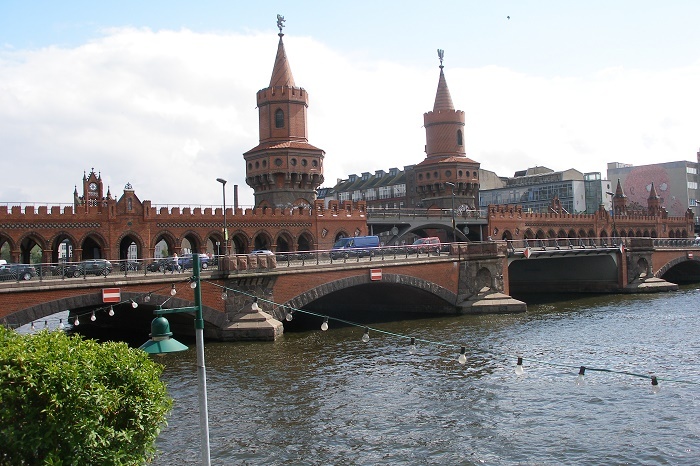 When the Berlin Wall was built in 1961 the bridge became part of East Berlin’s border with West Berlin. The West Berlin U-Bahn line was forced to terminate at Schlesisches Tor. 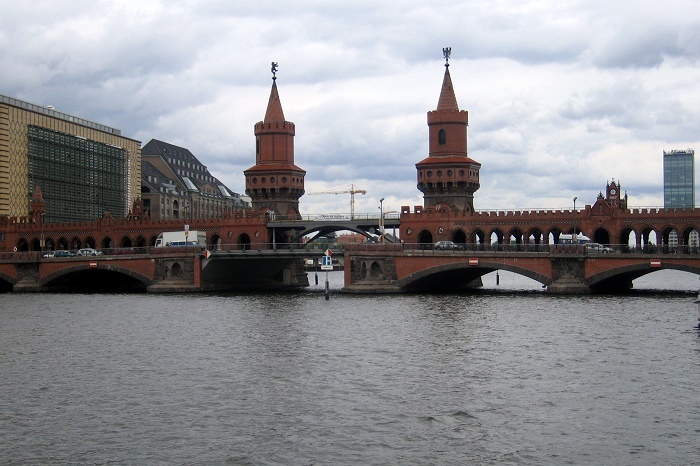 Nevertheless, beginning on 21 December 1963, the Oberbaum Bridge was used as a pedestrian border crossing for West Berlin residents only. 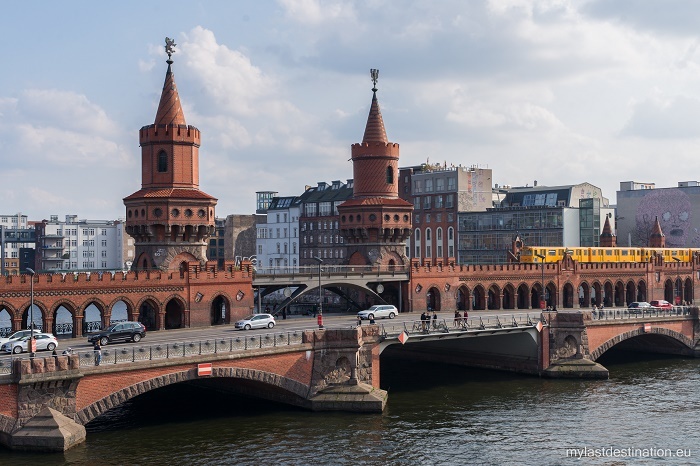 After the falling of the Berlin Wall, opening of the former border in 1989 to everyone, and German reunification the following year, the bridge was restored to its former appearance, albeit with a new steel middle section designed by the Spanish architect Santiago Calatrava. 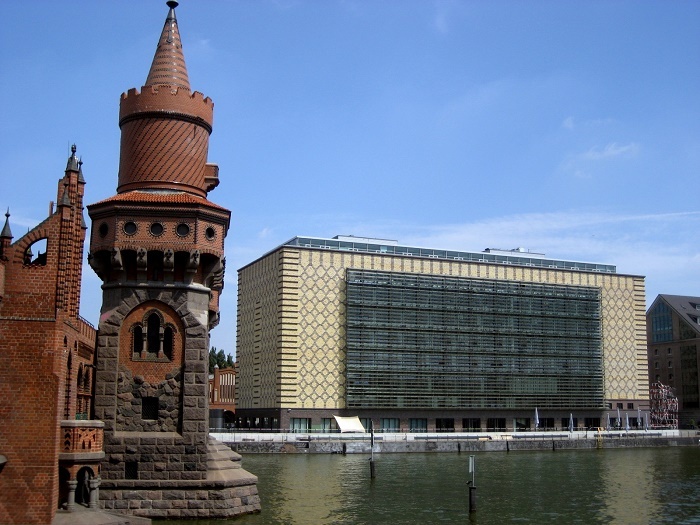 It opened to pedestrians and traffic on 9 November 1994, the fifth anniversary of the opening of the Berlin Wall, and the U-Bahn line to Warschauer Straße station was reopened a year later. Today the bridge is adorned by graffiti and street artists’ work. 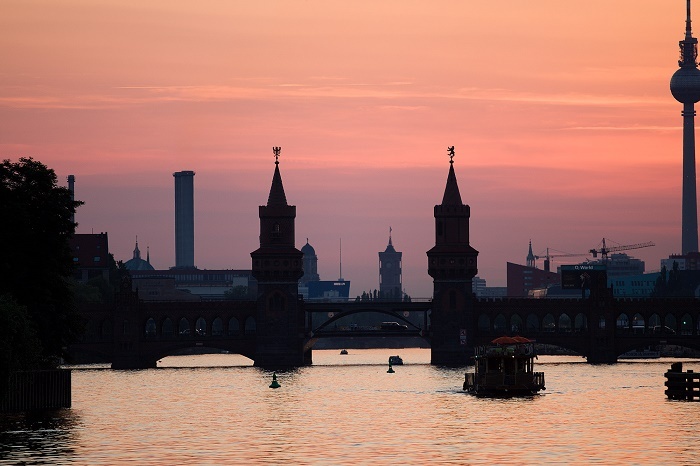 A sandy beach for chilling out in the summer has replaced the barbed wire of the no-man’s-land and techno music is the distinctive sound from the scene in the reunited districts of Friedrichshain and Kreuzberg.